Unlike some other WDW map apps out there, Disney World Maps sports a decidedly 2D look. On a large iPad screen this can look a bit lackluster, but for an iPhone it is perfect. 3D buildings take time and space, and you can see more faster with a simpler look. Color coding here helps. 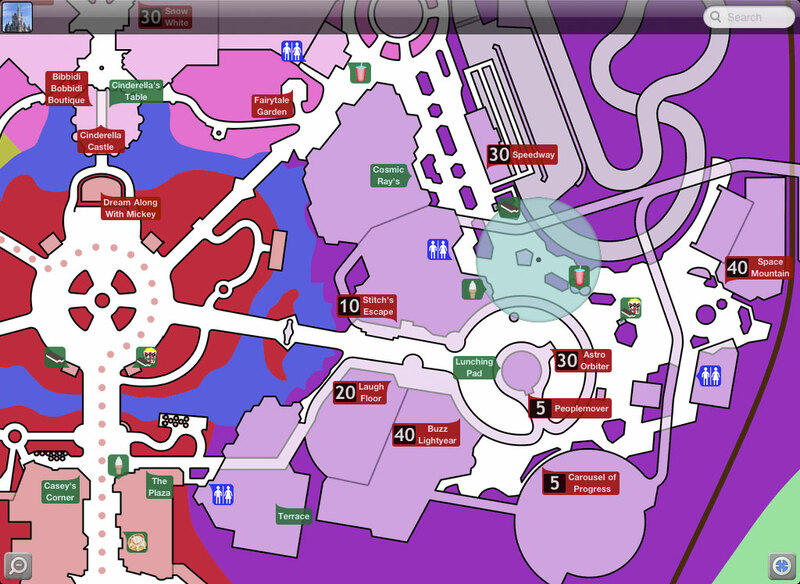 Red for attractions and rides, green for food locations lets you pick out what you need at a quick glance. The rides and food areas are actually word-labeled, which helps the unfamiliar to find things quickly. Wait times are listed right next to the ride, making a quick glance at the map area very informative. 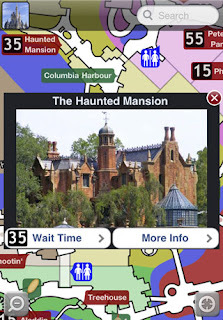 The wait times are semi-accurate, occasionally lining up with the official Disney info and other wait time apps, but better wait time apps can be found (but that's another post!). Tapping and food or ride will bring up a quick info screen. If it is a ride, there will be an option to add your wait time to the database for a more accurate result for the masses. You'll even get a picture (yes, even of the bathrooms) so you can easily spot your destination. What is missing are maps of some of the other major areas of WDW. 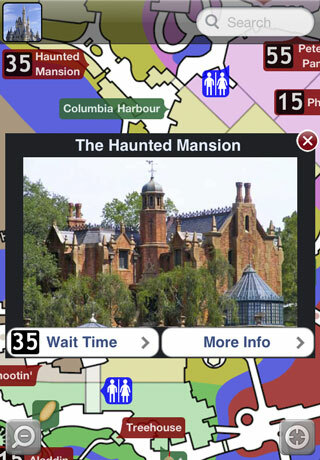 This app will cover the four major parks and the Downtown Disney shopping and entertainment area, but nothing else. If you are looking for resort maps and directions, water parks, other Orlando destinations, or Orlando airport layouts as some other apps have, you are out of luck here. Social networking features are also absent, but you do get a better description of the attraction that you normally see in a mapping app. This includes a little ride/restaurant background and height requirements if they exist for that experience. Walt Disney World maps is a simple to navigate app that really helps you get around and understand where you are going at a glance. Word labels really add to the quick look navigation, and real-time GPS on the same map (not a satellite overlay) is really helpful when you get turned around. This especially happens in the Animal Kingdom, where one Asian or African plant can start looking like the one you passed on a trail ten minutes ago and starts you questioning your sanity. It's not flashy or feature-loaded, but it has minimal windows to navigate and few options to worry about things you don't need. Bottom-line, its a very useful app and one of the few completely free mapping and wait-time solutions in the App Store if ads don't bother you. If they do, $2.99 is a pretty reasonable price for the functionality. It is also available as part of an app set all by VersaEdge called Disney World Magic Guide, but we'll talk about that another time. You can pick it up by clicking here, or from the App Store on your device.